The bad news is that Memphis seems to be worse than any big city in the country at making poor kids richer. The good news is that it’s already taking steps to fix this awful problem. According to a fascinating new study highlighted today by columnist Paul Krugman, a child born into the poorest fifth of the population in Memphis has only a 2.6 percent chance of making it into the top fifth. That’s the lowest rate among the country’s top 100 metro areas, and it compares to 6.1 percent in Chicago, 6.9 percent in Austin, 8.7 percent in Portland, 9.5 percent in Washington DC and 11.2 percent in San Francisco. As Krugman notes, it might be surprising that race didn’t seem to be a direct factor in social mobility. But another kind of segregation was a factor: income segregation. When jobs and wealth move ever further from a city center — further and further from places where it’s convenient to get around without a car — it makes it harder for people to work their way into the middle or upper classes. 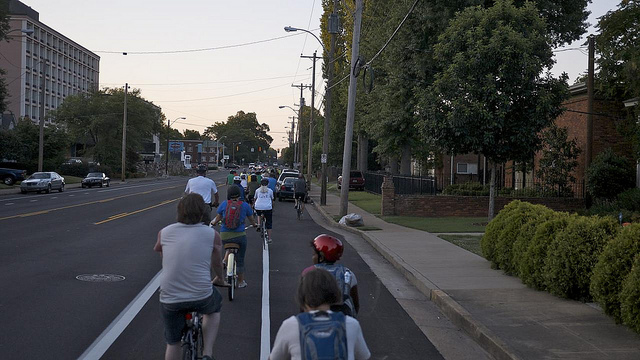 As we’ve been reporting for the last year, and will continue to explore, this is exactly what the City of Memphis has begun using better bikeways to do. By making its central city pleasant and efficient to get around by bike, the former worst city in the country for biking is setting out not to chase money as it keeps fleeing to the outskirts, but rather to lure that money back downtown. Where it can do some good. Green lane idea of the day: Cities can use bikes to bring jobs and wealth to them, rather than chasing jobs and wealth as they flee somewhere else. Memphis bike photo by Vic06.